Parents, with some changes in staffing and the need to keep the gym available for PE, recess, and church functions, students will be eating lunch in the classrooms. Although this seems to be a different experience, the students actually ate in their classrooms many times last year for the exact same reasons. Honestly, we found that they ate their lunches better, showing better table manners, less spilling and messiness and actually finishing their meal. We are still planning on scheduling “family” lunches, buddy lunches, combining classes together for special “picnics” and special rotations, as a new way to build community as we break bread together. The drama and hurt feelings for the little ones when a friend doesn’t choose to sit next to them is now gone. We believe this will be a more peace filled lunch system and are looking forward to the start of something great. Due to the construction and work in the kitchen this summer that has been extended briefly into September, we are UNABLE to start our hot lunch program for a couple of weeks. We apologize for the inconvenience that this creates but will let you know as soon as hot lunch begins again. We are pleased to announce our line-up of Fall After-School Enrichment Programs for our students. We have ONE link (6crickets) to sign-up for all our programs. Please take the time to get your children signed-up today before classes fill. Morning care is available 7:00-8:15 a.m. We have created an online form to make sign-up easy. Reserve your space https://stmonicasea.org/morning-care-contract/. Study Hall is a supervised, safe place for students to work on homework and study skills after school. Study Hall is held on Mondays, Tuesdays, and Thursdays from 3:10-4:10 p.m. in the school library for 5th-8th grades. Please complete Study Hall Contract 2018-2019 to reserve your space. Cost is $8/per session. Morning drop-off is a drive through procedure along the east side of 87th Ave SE. We have teacher aids to assist the children out of the cars. All cars should be facing North on 87th Ave, drive around the block to face the correct direction if needed. Please do not drop off your children on the other side of the street and let them cross the street. All cars should enter from the south end of the parking lot off 44th St. There are two lanes of traffic entering the lot. Stay in the right-hand lane if you are going to pick up students. This is a “drive through and pick up lane” only. Please DO NOT park in this lane. Cars must continue to pull forward as others exit. When you have picked up all your students, please pull into the left lane and exit the parking lot. If you plan to park in the limited spaces available, please enter from 44th St. and stay in the lefthanded lane. Abide by the coned off areas and park in lined spaces. For the safety of all, you must use the designated crosswalk only. School Office Hours are from 7:30 a.m. – 3:30 p.m. daily. Scrip on sale daily. On the morning of a child’s absence or late arrival for appointments, the school must be notified by 9:00 a.m. For your child’s safety, all absences, regardless of duration, should be notified daily. Email office@stmonicasea.org or call 206-232-5432. SchoolSpeak profiles need to be completed ASAP. Please take a moment to log into SchoolSpeak to make sure all student information is complete. If you wish to have your child walk to the library or have a carpool the Carpool/Walker Permission Form needs to be completed and turned into the office. Students needing medication administered during the school day will need to complete the Authorization for Medication Form and turn into the office. Save the Date! 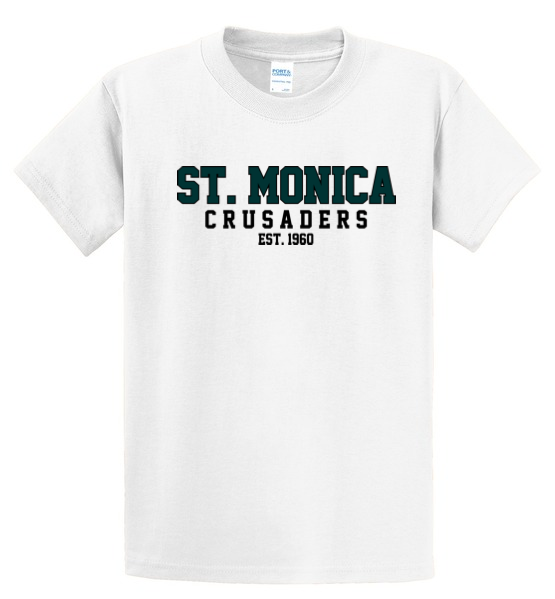 Our St. Monica Auction will take place on Saturday, March 9th, 2019.It is not too late to join our 2019 Auction Team! Please email jnorth@stmonicasea.org to be added to the committee list! Our team meets twice a month, August –December, on Monday evenings, and we would love some more detail-oriented people to join our team and help with audience development, data entry, procurement, decorations and securing sponsorships. If you are willing, we will find a spot for you! 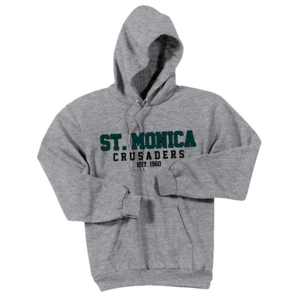 The month of September is the time to order St. Monica Spirit Wear! 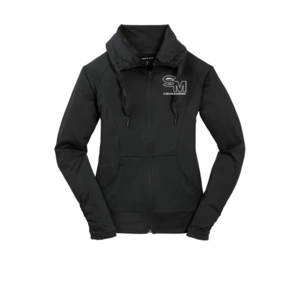 All orders must be placed by midnight on SEPTEMBER 30! 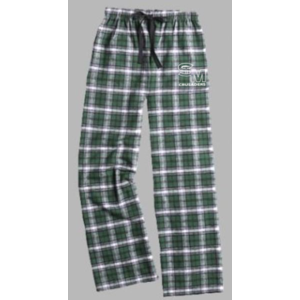 Items will be delivered to the school 3 weeks after online store closes. 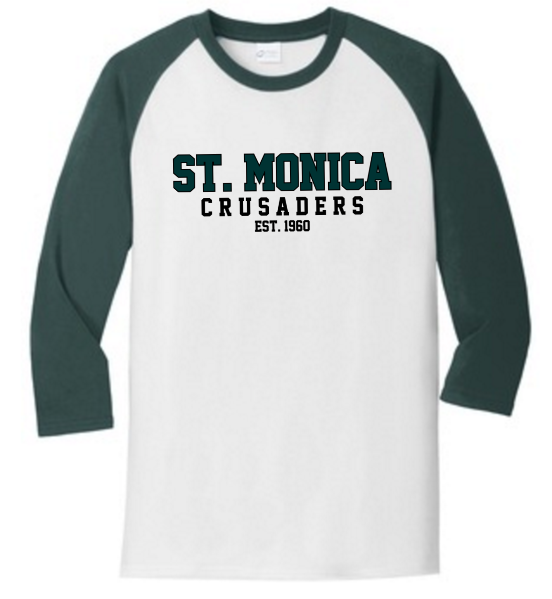 Students may wear Spirit Wear tops with uniform bottoms on Wednesdays. Proceeds go towards our events and activities! Mom’s back to School Social – Save the NEW Date! Friday, September 14 at 7:00 p.m. at Pam Hayden’s Home, check your email for the Evite sent and RSVP! This is a casual, low-key, event — dress up if you want, but yoga pants & flip flops are welcome! Wine, beer and assorted non-alcoholic beverages will be available as well as light appetizer type snacks & desserts. The Parent Club held a New Parent Orientation on Monday night. Many new families came to learn more about what to expect through the school year. If you are a new family and missed the meeting or just want a refresher on what you learned, here is a link to the New Parent Presentation. Feel free to reach out to our Welcome Committee Chairs, Justyna King or Mary Chu, if you have any questions. Sunday, September 23, 2018 @ 2 p.m.
Sunday, September 30, 2018 @ 2 p.m.
Championship Meet: Sunday, October 7, 2018 @ 2 p.m. Registration closes for First Communion classes on October 6, for current St. Monica Second Graders. Classes will be held on Sundays beginning October 7, in School Classrooms at 10:10 a.m. If you are registering for First Communion you will need a copy of your child’s baptism certificate. Classes begin Sunday, October 7th. All forms for both Confirmation and First Communion are due on November 14, 2018. Fri. September 14- Mom’s Back to School Social 7 p.m.
Wed. September 12- PreK Curriculum Night 6:30 p.m. New Date!!! Thurs. September 13- K-8 Curriculum night 6:30 p.m. New Date!!! Pat Porter – Good bye. After 20 years at St. Monica as a technology specialist and most recently part-time library, Mrs. Porter has decided to move to another community closer to home and with full-time library duties. Her love of children and story telling will continue to grow and flourish at her new school. We wish her well on her new path as she will be very missed. « Back to School News!